Your skin is not the same today as it was when you were a teenager. Your makeup style and skin care needs will also change at different phases of your life. That means your makeup should change as well. Now is the time in your life when it's encouraged to go bold. Vibrant eyeshadows, eye-catching lip colors, and big lashes are perfect for your youthful look. At this stage in your life, powder, blush, bronzer, eye shadow, eyeliner, mascara, brow gel or pencil, and lip gloss are all appropriate. You may also want to take advantage of items like acne-fighting concealer, which can cover up acne while preventing future breakouts. Women's Health recommends this to clear and perfect the skin. Teen Vogue recommends the E.L.F. Little Black Book, but this more affordable palette will do the trick. Teen Vogue recommends this eye pencil because it's easy to use for beginners and comes with a conditioning mascara. Teen Vogue loves this product because it comes with a self-sharpening eyebrow pencil on one end, and a built-in brush on the other side. This is frequently recommended for beginners because it is easy to apply and can produce dramatic results. Dermatologists frequently recommend this to clear and perfect the skin. Teen Vogue recommends this because it offers great color payoff with each swipe. This brings the drama and is frequently recommended for women in their 20s. Teen Vogue recommends this for dramatic results. This is frequently raved about online because it's perfect for beginners. Teen Vogue recommends this for women in their teens and 20s. At this phase of your life, it's time to trade in the lip gloss, shimmer powder, and dramatic eyeliner for something a little more mature, such as a lip stain, foundation, and smudgeable kohl eyeliner. Find makeup that improves the condition of your skin while helping to perfect it. You also want to continue protecting your skin from the sun's harmful rays with things like BB creams and tinted sunscreens. BB cream will offer a number of benefits, and can serve as your sunscreen, primer, foundation, and concealer in one. The Today Show found that a good eye cream, wrinkle treatment, and tinted moisturizer are also must-haves at this stage of your life. Teen Vogue recommends this for women who want to protect, preserve, and improve the condition of their skin. Teen Vogue claims noticeable results and simple application. The Urban Decay Naked palettes are frequently recommended for women of all ages (particularly at this phase of your life); instead of spending your whole budget on one palette, consider this famous dupe. This will enhance your lashes and eyes in one. This is frequently recommended because it enhances the volume and fullness of dull or flat lashes. PopSugar and Teen Vogue like this for the right amount of drama, and a number of the Victoria's Secret Angels also swear by them. Teen Vogue loves this because the blend of antioxidants will help maintain your skin's youthful look, while SPF 20 will protect it from the sun's harmful rays. This is frequently recommended because it can hydrate dry, aging skin while providing medium coverage. Bronzer will help sculpt and define the face at any age. This one is frequently recommended because it is completely matte and offers no shimmer or shine. Allure recommends this for just the right amount of shimmer at any age. Allure recommends this for lashes that are beginning to lose their volume. This duo is frequently recommended because it offers a wax pencil and filling powder in one. The Today Show recommends this because it offers the right amount of drama for all ages. You may need a bit more coverage for issues like sun damage and signs of aging. Look for moisturizing items that contain SPF and/or antioxidants to protect your skin. Go light on powders or anything that can settle into fine lines. You should also stay away from matte or shimmery eye shadows because they can make skin appear aged and dry. Try dark brown eyeliner over black for a more sophisticated, sultry look. It's also time to trade in any glossy lipsticks for matte. Eyelashes flatten as you age, so you'll also want to invest in a good eyelash curler and lengthening or curling mascara. For the most youthful, flawless looking skin, you'll want to use foundation, concealer, blush, and highlighters. In fact, celebrity makeup artist, Joanna Schlip, said that highlighters are the secret weapon for women ages 40 and over because they can provide dramatic effects that mimic a facelift. The Today Show also recommends a good CC cream and wrinkle treatment at this stage of your life. Better Homes and Gardens recommends this for women over 50 because it covers dark circles without settling into fine lines. This is frequently lauded because it covers imperfections, hydrates the skin, prevents sun damage, and fights the signs of aging. Better Homes and Gardens recommends this for women over 50 because it blurs dullness, delivers anti-aging benefits, and visibly lifts the skin. This can define your eyes without being too matte or shimmery. This can be smudged for a more subtle look that instantly adds drama and smokiness to the eyes. Better Homes and Gardens recommends this for women over 50 because it can help to instantly shape and frame the face and is subtle enough even for sparse brows. Better Homes and Gardens suggests this for women over 50 because it is creamy, nourishing, and adds just enough drama. The Today Show recommends this because it will cover up signs of aging while protecting your skin from further sun damage. This cult classic will fight the signs of aging, erase the appearance of dark circles, puffiness, and fine lines, and conceal blemishes in one step. This is frequently recommended because the creamy formula is ideal for dry or aging skin. This can enhance the eyes, making them appear more sultry, without adding too much shimmer to your look. Harper's Bazaar recommends this for women over 50 because it is creamy and can provide the right amount of intensity. Harper's Bazaar suggests this for women over 50 because it will smooth out fine lines on the lips. 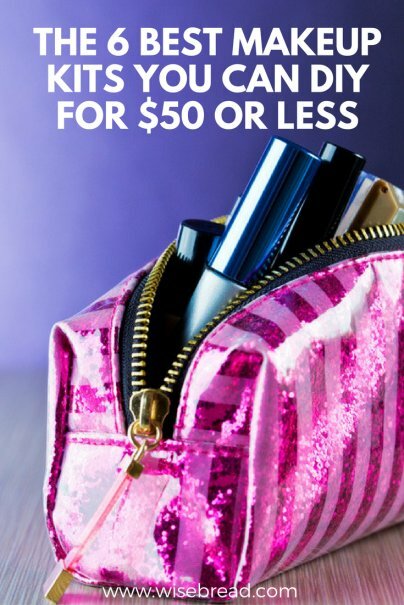 What other items would you include in an age-appropriate makeup kit for under $50? Please share your thoughts in the comments!